The Zero Compromise Optic ZC420 is the ultimate solution for all your target engagement requirements. With a generous low end of 4X boasting a massive field of view of 28 feet, your close range needs are fulfilled. Topping out at 20X gives ample magnification for your long range target engagements out to and beyond 1000 yards. Optical performance is unmatched – Our optical engineers have set the next standard for clarity, light transmission, and resolution in a compact package. Performance like this has never been seen before in this magnification range and objective size. Color rendition is natural with a slight enhancement in contrast for the finest view possible. Total light transmission to the eye is 92% and the resolution is best in class. Mechanical construction perfected – When our customers demand ultimate reliability, we deliver the most robust construction techniques in the industry to deliver on this request. Our mechanical engineers have designed some of the most well respected rifle scopes in the world, and have gone several steps further for increased durability, repeatability, and ruggedness. Hardened steel components are used in high wear areas such as the internal click mechanisms for the elevation and windage turrets to ensure a lifetime of repeatable adjustment values. Optical lenses are mechanically locked in place as well as bonded along the edges for total and complete structural integrity. We know how others build their scopes, and we’ve developed techniques and methodologies to deliver the best rifle scope ever produced, because our customers demanded better. We are happy to deliver! Unmatched reticle diversity – Our staff is highly involved in the shooting and hunting industry and have designed the very best reticles available. New designs have been developed by ZCO to enhance reticle diversity and usability. No matter your application, we offer a reticle that will suite your needs perfectly. Enhanced features – Our products are built for the most demanding users, so we offer the best features never before seen in a single product. Shooters can now have enhanced ergonomics through either Right Windage Turret or Left Windage Turret configurations, locking turrets, multiple illumination settings including levels compatible for night vision equipment, fast focus locking diopter, true to indicated parallax adjustment with zero backlash, large adjustment range for elevation and windage travel, built in Return 2 Zero, and easily reset turrets once zeroed. 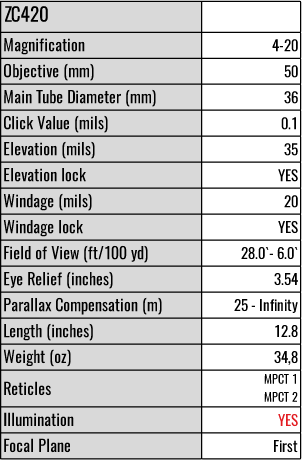 These features are all rolled into a rifle scope only measuring 12.8 inches long and weighing a mere 34.8 ounces. Our dedication isn’t to just building rifle scopes, far from it. We are dedicated to building the absolute best rifle scopes in the world. We don’t skimp on quality to meet a price point, we simply use the best material and techniques to build the scope you’ve always dreamed of. Quick and easy financing for guns and optics over $2000. Click here to apply! Click the button below to add the Zero Compromise Optic: ZC420 4-20x50, MPCT1 Reticle to your wish list.